Earth Day is a great time to tell you about Sprig Toys, a Colorado-based company that makes battery-free, eco-friendly, paint-free, kid-powered playthings. Cool, right? Well, even cooler is the fact they make their toys out of a proprietary material- Sprigwood- a biocomposite made from wood and reclaimed plastics. Sprig Toys are molded with no extraneous bits and bobbins or harmful paints and are displayed in very minimal packaging to reduce waste. Sprig Toys has just introduced a new collection called Sprig Hollow. 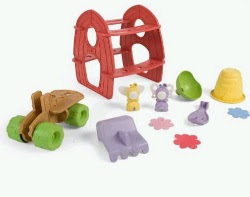 All of the Sprig Hollow playsets are water-resistant so they can be used indoors or outdoors. The vehicles all feature detachable parts that can be used as rakes, shovels or buckets, making them perfect for sandbox and pooltime fun. Bee and Butterfly’s Farm even includes plantable seed-embedded paper flowers for your little gardeners. Jasper and Roo both fell in love with Sprig Hollow instantly! I also appreciate the fact that Sprig Toys plans to keep upcoming toy collections compatible with their current lines, so all the pieces will remain interchangeable by design. Smart! Their toys are so cool, especially that they are, like you mentioned, gender neutral. Your kids seem to like them! Wow, they certainly look like they love those! They couldn't even wait to get dressed before they began playing! I'm off to check out the site, thanks for the recommendation. How cute! I didn't realize the Sprig toys were that large.